Whenever I see an otherwise sensible person express support for a value-added tax, it triggers a Pavlovian response. And it’s not a favorable reaction. I’ve criticized Tom Dolan, Greg Mankiw, and Paul Ryan, for pro-VAT comments. I’ve gone after Kevin Williamson, Josh Barro, and Andrew Stuttaford for the same reason. I wrote that Mitch Daniels, Herman Cain, and Mitt Romney deserved skepticism from voters for being sympathetic to a VAT. I also dinged Rand Paul and Ted Cruz for including value-added taxes in their campaign tax plans. I strongly disagreed with pro-VAT articles by Peter Morici, Jim Carter, Geoff Davis, and Alan Murray. But I just read a pro-VAT column and I liked it. So what happened? Have I surrendered to big government? Did I ingest some magic mushrooms? Actually, I think you’ll agree that I’m still the same lovable guy. Yes, Professor John Cochrane of the University of Chicago (also a Cato adjunct scholar) has a column in the Wall Street Journal that embraces a VAT. But unlike all of the others I just cited, he includes a condition that is mandatory, necessary, vital, and non-negotiable. It’s so important that it deserves the opposite of fine-print treatment. …eliminate entirely the personal and corporate income tax, estate tax and all other federal taxes. …it is essential that the VAT replace rather than add to the current tax system, as it does in Europe. Amen. John hits the nail on the head. The VAT isn’t theoretically bad. Like the flat tax, it would have one rate. There also would be no double taxation of saving and investment. And it also can be designed to have no loopholes. In other words, the good news is that the VAT – when compared to the internal revenue code – is a less-destructive way of generating revenue. The bad news, though, is that the VAT is capable of generating a lot of revenue. 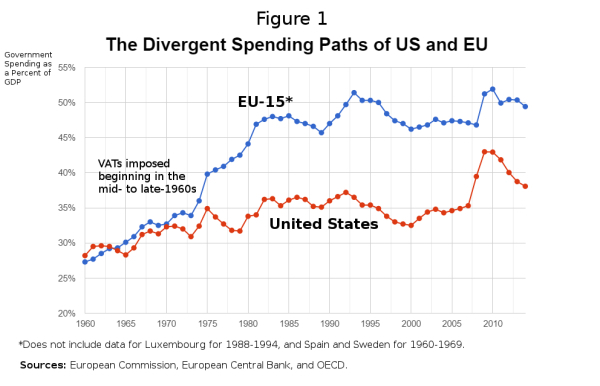 And as we’ve seen in Europe, that’s a recipe for enabling a larger burden of government spending. Which is why the idea of a VAT should only be on the table if the plan would first abolish all other federal taxes. Which is what John is proposing. Except I’d take it one step farther. Just like I’ve argued when contemplating a national sales tax, I’d only allow the VAT if we first repeal the 16th Amendment and replace it with something so ironclad that even John Roberts and Ruth Bader Ginsberg couldn’t rule in favor of an income tax at some point in the future. By the way, John is right that the economy would grow faster if the income tax was totally abolished. The current system is filled with warts. Much of the current tax mess results from taxing income. Once the government taxes income, it must tax corporate income or people would incorporate to avoid paying taxes. Yet the right corporate tax rate is zero. Every cent of corporate tax comes from people via higher prices, lower wages, or lower payments to shareholders. And a corporate tax produces an army of lawyers and lobbyists demanding exemptions. An income tax also leads to taxes on capital income. Capital income taxes discourage saving and investment. But the government is forced to tax capital income because otherwise people can hide wages… The estate tax can take close to half a marginal dollar of wealth. This creates a strong incentive to blow the family money on a round-the-world cruise, to spend lavishly on lawyers, or to invest inefficiently to avoid the tax. …A reformed tax code should involve no deductions—including the holy trinity of mortgage interest, employer-provided health insurance, and charitable deductions. The interest groups for each of these deductions are strong. But if the government doesn’t tax income in the first place, these deductions vanish without a fight. By the way, I will quibble with a couple of things he wrote. First, I don’t necessarily think the correct corporate tax rate is zero. What’s important is eliminating either the corporate tax or the tax on dividends. That way the income is only taxed once. And since it’s probably administratively easier to tax the income once at the business level rather than once at the shareholder level, I’m not fixated on abolishing the corporate tax. Second, it’s very important to get rid of double taxation (what he calls “capital income”), but you don’t need a VAT to make that happen. There’s no double taxation with a flat tax. Third, he should have explicitly included the state and local tax deduction in his list of loopholes to abolish (I’m guessing he assumed it would be the first deduction on the chopping block and therefore didn’t need to be mentioned). There’s another part of John’s column that deserves attention. He points out that you need to have small government if you want a low tax burden. …if the federal government is going to spend 20% of gross domestic product, the VAT will sooner or later have to be about 20%. Tax reform is stymied because politicians mix arguments over the rates with arguments over the structure of taxes. This is a mistake. They should first agree to fix the structure of the tax code, and later argue about rates—and the spending those rates must support. At the risk of being pedantic, I think the VAT rate would have to be significantly above 20 percent, both because the tax base will be smaller than GDP and also because there will be loopholes or rebates. But the point he’s making is spot on. You can’t have a low tax rate and a big government. I’ve made the same point when writing about Belgium and Germany, nations where middle-class taxpayers are pillaged because the welfare state is too big. My bottom line on this issue is that Professor Cochrane has produced a column showing that a VAT is theoretically worth considering, but only if all other federal taxes are permanently abolished. But since that’s not going to happen any time soon, I don’t think there’s any reason to ease up on my dogmatic (and pragmatic) opposition to that levy. P.S. My clinching argument is that Reagan opposed a VAT and Nixon supported a VAT. That tells you everything you need to know. Dan, you speak of tax optimization. And, yes, you might be able to get at it over time. What I have not heard from anybody, is tax CONTROL theory. That entails the path we take to get where we want to go. You cannot simply change the tax plan overnight, and expect the public to immediately adjust. Instead, people would sit on the money and investments as they evaluate (some for several years) what this will do to their own cash flow. Our economy could not handle this. So, what is the plan for the path to get there? Please lay that out-.i.e. first do this, then do this. Problem being that while you have one congress who decides on the fix the next will undo all that work as they mess with the system their predecessors put in place. They think they have to do this to show they are doing their job. Another point is that the sole tax that the constitution originally allowed for from the feds was tariffs. That means imported goods. And I agree with the founders on this point. Equilibrate the prices of foreign versus domestic, and you solve many problems. More jobs too. Heaven forbid we should ever go to war again, as we could not ask those we are warring against to develop the machinery to fight them. Replacing the business portion of the job killing 7.65% payroll tax with a 4% VAT – (the lowest VAT rate in the world). The government should have to rely on support based on the quality of their work product through citizen donation. A hundred years of criminally negligent fiscal policy proves that politicians should have nothing to do the Nation’s budget. You never address the obvious. Who cares what some college professor thinks of VAT. Taxation is theft. Nothing you say or argue can change that reality. Every thinking person should be opposed to taxation. In that vein, we all should “our Lives, our Fortunes, and our Sacred Honor” to oppose taxation at every level. The only way to get rid of the income tax is to repeal the 16th amendment; and there is no way in H E double toothpicks that will ever happen. Australia adopted a G.S.T (Goods and Services Tax), whilst removing some other taxes. In theory, things should be simpler, but life is just as full of red tape, strangling small businesses, as before. All this is “what-if” hypothetical because it’s politically unlikely to happen. But you can count me as a supporter of VAT or other consumption type tax IF we got rid of other taxes. Not lower income or capital gains taxes, but zero. Business investment is highly beneficial, so we want the least impediments to investment. A consumption tax rewards savings and investment. It doesn’t punish income. But again, I don’t see any of this happening in the near future from a political standpoint. The FAIRtax℠- i.e., H.R. 25 (“FT”) is a Progressive Scam – we need a Simple 10% “Tithe” Income Tax! FT marketers advertise that it is MORE Progressive (more welfare). Of prime importance, the Prebate is not a real refund of FT paid, as it appears to be. It is a $600B NEW ENTITLEMENT, with all Americans receiving a big monthly federal check –a bad idea. It is financially and politically unwise to create yet another a huge entitlement that will only increase in the future. FT (Prebate) has the poor pay for no part of the fed budget, pay nothing for their personal SS/Medicare benefits, AND give them a big tax welfare check. FT (Prebate) extends tax welfare to the non-working poor – and also gives SS/Medicare to all regardless of work, by removing the tax cost of reporting SS Wages, which “invites” fraud in reporting them (as also noted by other authors). The Prebate is marketed as merely repaying the poor for any FT they pay (as if we all agree with that), but it would actually pay them far MORE by “assuming” the poor spend more than the underlying HHS Poverty Guidelines and that they will pay FT on all of their purchases (but they WON’T). They claim (deceptively) FT is “only” a 23% sales tax. If goods cost $100 BEFORE FT, you add $30, total $130. They deceptively divide the $30 FT, by $130. Some FT’ers still market the old FT lie that we get a big raise (no Income or P/R taxes), AND FT prices would be the same as today’s – that just cannot be true. FT is merely supposed to change the method of paying the same total tax dollars we pay today, so if take home pay rises, prices must go up by the same total dollar amount (except for minor savings). Even the AFFT now admits that prices would rise substantially, and perhaps the full 30%. The 30% rate is really 50%. While claiming to be “fully transparent – just look at your receipt and you see all the tax” – FT hides another appx. 20%. USED property is advertised as exempt from FT, but that may be a cruel hoax, because of the practical difficulty of establishing that the buyer has met the requirements that FT was paid AND that none of 3 listed credits against the FT were claimed. It is a myth that “IRS is Abolished.” FT’s new IRS (i.e., STAA) may be more invasive. The buyer is liable to pay FT and receive/show a receipt. STAA may audit CONSUMERS and may require an “Annual FT Summary”. As also noted by Cato Institute (as Dan Mitchell warns us in this arfticle and to which I add that teven the rep[eal of the 16th Amentment STILL leaves us vulnerable to an Income Tax)), FT leaves us more vulnerable to winding up with both a NEW Income Tax AND FT (instead of adding 20-30% on top of the FT’s already high 30% rate). Congress would surely repeal FT’s laughable “Sunset Clause” and (with the 16th Amendment surely still firmly in place) would use the excuse of the large revenue shortfall from evasion/avoidance to enact a new Income Tax (I believe Congress’ goal is to saddle us with both taxes). To summarize, it appears that FT initially required a 70-80% rate. They simply “assumed” away 20-30% evasion/avoidance, hid another 20% – all to get the rate down to 30%. Then they deceptively twisted the statute to make 30% superficially appear to be “only” 23%. Seniors would start to pay for SS/Medicare again. Some would pay a 2nd-3rd tax. Many middle class seniors would pay more FT than they would have paid in Income Tax and many would lose purchasing power. FT promises grand economic benefits which are all entirely unpredictable – mere Hype & Change. FT employs marketing hype and hyperbole, making countless undeliverable claims. We need a very Flat Income Tax; No: Deductions/Exemptions/Credits, a 10% rate, business income taxed only once and on a very simple basis – IRS is neutered, 1 page tax filing, everyone pays, more evolutionary. Perhaps you could write an article as favorable to the FAIRtax as this one is to the VAT? FAIRtax IS a better solution to the US tax problem than either the Flat Income Tax or the VAT, you know. While eliminating all other “taxes”, note that some “taxes” are not really “taxes”, at all. FIC (for Contributions)A was misleadingly sold as funding of retirement pensions. Any VAT should not fund SS. The fed gov should get out of the pension business and people should fund their own pensions (first, pay off everyone with 6% interest, and let them roll their SS “accolunts” into a ROTH IRA tax-free; fund it by printing $). Similarly, set Medicare on a course of getting the fed gov out of ity, by convefrting to private citizens funding all of the benfits via real (non-means-tested) premiums (not via and income tax. That is, do not fund it with the VAT. Even if we repealed the 16th Amendment, Congress could still enact an Income Tax, but it must be apportioned to the States (based on population).